Earlier this week, I posted a blog about Change. In keeping with that same theme, let’s use this week’s WI to explore a social and emotional competency entitled Catalyzing Change. As I referenced in that blog, when we look at the two foundational components of UnCommon Leadership it is a focus on developing yourself (personal) to your maximum potential and then personalizing your leadership to the people you’re entrusted to lead. The blog talked about the secondary element and went beyond the standard high level thinking about Change that’s driven by neuroleadership thinking. It spoke to the fact that using the Birkman Assessment, a leader can really drill down into each and everyone of her followers and their approach to Change. If you have not read that blog yet, it might help to cement today’s learning by reading it first. Based on these characteristics, how would you rate yourself on a 1 to 10 scale with 1 being that you don’t resemble any of these statements and 10 that you wrote the definition and could add even more to it?! Unless you’re in the top third of the rating (8,9 or 10) then there is probably room for improvement, right? How would you go about developing this social and emotional competency then? As is always the case, there are plenty of resources at your fingertips and I will reference one of the best I’ve found on the topic of change. In 1996, John P. Kotter wrote a book titled Leading Change that became a world-wide best seller. He followed that up in 2002 with The Heart of Change. In the 1st book, he provides an eight step road map for catalyzing change. From my perspective, the original book is very much an academic “book” but by the time he and his co-author wrote the follow up, the change in the book’s tone is to one that recognizes the need to touch the “hearts” of people to connect their “heads” to the initiative. The 2nd book is also filled with stories of people and companies that applied the eight steps in leading large-scale change initiatives. On page six of the The Heart of Change, the authors make this statement: “Evidence overwhelmingly suggests that the most fundamental problem in all of the stages is changing the behavior of people.” This helps frame the previous blog in that you, as the leader, must know the unique behaviors and attitudes about your people if you’re going to lead change effectively. There was also a big shift in the two books. In the first book Kotter describes the differences between successful change initiatives as Leadership and those that were unsuccessful as Management. In book number 2 he gets the connection between the head (management) and leadership (the heart)! In the first book, he describes change that doesn’t work as a three-step process of 1)Analysis, 2) Think, and 3) Change. In the second he labels successful change as 1) See, 2) Feel, 3) Change. When you read the 8 steps and then compare them to what characterizes someone with this social and emotional intelligence competency you see a lot of similarity which is why I chose to reference Kotter’s books. Rather than go into any more detail here, you now have compelling resources with proven track records of helping people lead change. Be a wise, UnCommon Leader and learn from the experiences and practical application of others! 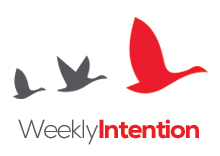 The closing message is the same theme that inspired the entire Weekly Intention blogs – get Intentional about becoming an agent of Change! It won’t happen unless you do. Ready, set, GET INTENTIONAL!